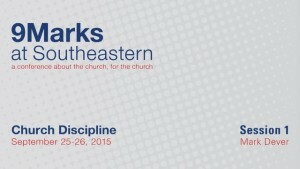 Mark Dever, pastor of the Capitol Hill Baptist Church, preaches at the 2015 9Marks at Southeastern event on church discipline. Speakers gather together to discuss topics explored in Mark Dever’s sermon. Garrett Kell, pastor of Del Ray Baptist Church, preaches at the 2015 9Marks at Southeastern event on church discipline. Speakers gather together to discuss topics explored in Garrett Kell’s sermon. Danny Akin, president of Southeastern Baptist Theological Seminary, preaches at the 2015 9Marks at Southeastern event on church discipline. Thabiti Anyabwile, pastor of Anacostia River Church, preaches at the 2015 9Marks at Southeastern event on church discipline. Speakers gather together to discuss topics explored in Thabiti Anyabwile’s sermon. Mez McConnell, Ministry Director of 20schemes, preaches at the 2015 9Marks at Southeastern event on church discipline. Speakers gather together to discuss topics explored in Mez McConnel’s sermon.